Kenny Omega is leaving New Japan Pro-Wrestling, according to a report in the Jan. 7 issue of Tokyo Sports. This comes three days after Omega lost the IWGP Heavyweight Championship to Hiroshi Tanahashi at Wrestle Kingdom 13, and amid furious speculation over Omega’s future in wrestling. Canadian native Omega has wrestled for New Japan since 2010, and has been based in Japan since 2008. In that time he’s become the biggest Western star for the biggest wrestling promotion in Japan, and a key figure in New Japan’s rise in popularity in the West. His future has been in question for months, though, with his New Japan contract ending this month. If this report is accurate, he’ll be done with New Japan after becoming only the seventh gaijin star to hold its top championship. If Omega does leave, one of the top two destinations for Omega is assumed to be WWE, the largest wrestling company in the world, which is flush with money from two TV deals that start later this year, and which has recently ramped up its signing of prominent wrestlers from the independents and other promotions. The other is All Elite Wrestling, the new promotion being started by Jacksonville Jaguars’ co-owner Tony Khan and Omega’s fellow members of the Elite, the Young Bucks and Cody and Brandi Rhodes. If he signs with WWE, his New Japan tenure is definitely over; if he signs with AEW, it’s questionable whether he’d still be able to work for New Japan. It’s believed that All Elite Wrestling would like to have a working agreement with New Japan, but that’s complicated by New Japan’s long-running partnership with Ring of Honor, the former American home of the Elite. If ROH refuses to allow New Japan to work with AEW, and if New Japan decides to stay loyal to their American partner and not end their agreement with ROH, then Omega and the other stars of AEW wouldn’t be able to work with New Japan. WWE, meanwhile, doesn’t cooperate with other promotions, except for a handful of small independents that are unofficial feeder systems for the company. I would quote the Tokyo Sports article, but I don’t read Japanese, and the Google translation is almost nonsensical. Chris Charlton, a noted Japanese wrestling expert, has translated part of the article on Twitter. The thing about that quote is that, even though it could be the words of a man who’s decided to leave his current employer, it also sounds like something a guy would say in a wrestling storyline. A former champion, dejected after a decisive loss, leaves the scene for a short while, before returning with renewed focus and vigor? That’s not exactly an uncommon wrestling story. 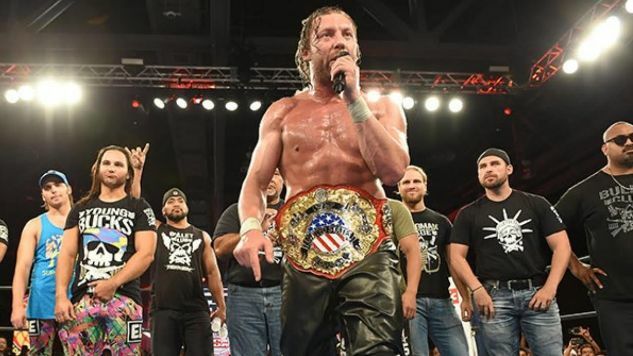 Omega has a history of issuing vague statements about his future when his contract is close to running out, and has always chosen to stick with New Japan. Tokyo Sports makes it sound like he’s definitely gone, but those quotes, as translated by Charlton, resemble the same vague and non-committal statements Omega’s made in the past. So Kenny Omega might be leaving New Japan. That’d be a big blow to the company’s continued growth in North America, but it weathered the loss of A.J. Styles and Shinsuke Nakamura three years ago, and have a number of talented wrestlers under contract who could thrive with the kind of main event push Omega received. The company with the most to lose from Omega’s eventual decision is the one that hasn’t put on a show yet; Omega signing with WWE will be a major preemptive blow to All Elite, which would have to launch without the biggest star from the stable that the company is named after. The Elite has pledged to stick together no matter where they end up, but the current set of unique circumstances might compel WWE to make Omega an offer he can’t refuse. WWE could undermine its biggest international competition and a potential new threat in its home market with one signing, while also potentially finding a new top star to help fill the void created by Roman Reigns’s leukemia diagnosis. And with billions on the way from Fox and Universal, WWE could easily make a massive money offer to any free agent in its sights. Still, this is pro wrestling, where obfuscation is the name of the game. As translated, Omega’s statements are open to interpretation. Until he personally announces something himself, we won’t know where his career will take him next. One thing that is certain, though: KUSHIDA is definitely leaving New Japan. The multi-time IWGP Junior Heavyweight champion announced his departure at a New Japan press conference tonight, noting that he’d be headed overseas. There have been strong rumors tying KUSHIDA to a WWE deal over the last several weeks, so it’s possible New Japan’s top junior will be appearing soon on NXT or 205 Live. Somebody with KUSHIDA’s talent and charisma should probably go straight to the WWE main roster, but who knows if WWE agrees.